Rohdamine B-encapsulating microspheres, seeding particles optimized for Particle Image Velocity. We are herein pleased to introduce our new product, FLUOSTAR® fluorescent microspheres, for the community of flow visualization. 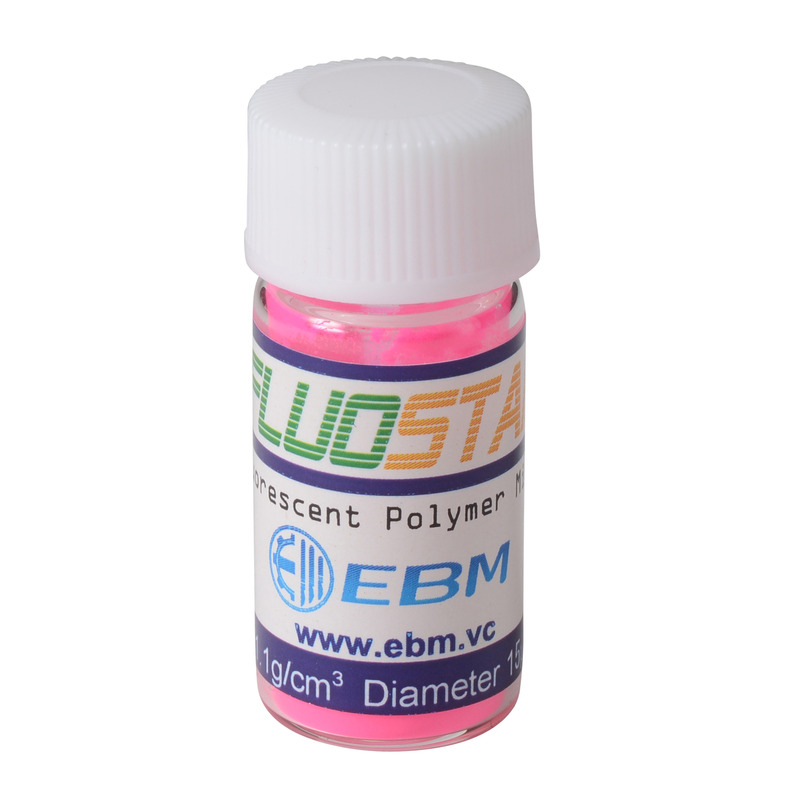 The FLUOSTAR® microspheres are designed for FLUORESCENT PIV (particle image velocimetry). The efficacy of fluorescence is appreciated in a number of PIV applications since it can boost the signal-to-noise ratio. However, such fluorescent particles, particularly those available commercially, are not always satisfactory as a flow tracer due to the disadvantage of the poor emission efficiency, mismatched density, undesirable size, or the high cost. All these concerns are well solved for FLUOSTAR® particles. We would like to emphasize the prominent emission efficiency of orange-color fluorescence with a green-color light illumination. The strong fluorescence can be even observed by sight with a 5 mW laser pointer. Besides, the relatively low cost realizes FLUORESCENT PIV in industrial large-scale flows. As such, our mission is to contribute to extend the frontier of PIV applications as a reliable fluorescent particle supplier. See our latest application note!!! FLUOSTAR® microspheres are even used to evaluate coronary artery bypass grafting by analyzing the hemodynamics in surgical medicine.